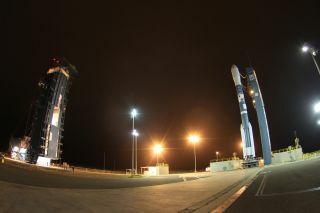 A United Launch Alliance Delta 2 rocket stands ready to launch NASA's Aquarius/SAC-D mission from Space Launch Complex-2. With its final scheduled flight looming just three weeks away, the workhorse Delta 2 rocket has won the right to rejoin the competition for future NASA satellite launches. NASA announced Friday (Sept. 30) that the vehicle will take an "on-ramp" to again be included on the roster of rockets that the space agency can chose from when deciding launch assignments. "We are extremely pleased NASA has added the reliable Delta 2 to the NLS-2 contract and look forward to continuing the legacy of the program," Michael Gass, United Launch Alliance's president and CEO, said in a press release. "ULA has demonstrated its ability to fully integrate Atlas 5, Delta 4 and Delta 2 product lines allowing us to continue offering medium launch capability at the best value for our customers." When NASA announced its new contracting system a year ago, the Delta 2 was no longer included in the available lineup of rockets for the agency to use. The so-called NASA Launch Services-2 contract enables boosters to be purchased by NASA for unmanned spacecraft missions over the next 10 years. The Delta 2's exclusion meant it was unable to bid on prospective NASA launches, and the situation suggested the rocket's flying days could be ending because the U.S. Air Force also had left the rocket. As the original backer of the Delta 2's creation in the 1980s, the Air Force successfully used the rocket for two decades to construct the Global Positioning System and sustain the orbiting constellation via dozens of launches to construct. "The medium-class market that Delta 2 has served for so many decade has really shrunk over the last few years. It's just hard to find a business case that works, that allows you to be able to launch the one or two per year that market demands right now and be able to do it for a reasonable price," Vernon Thorp, United Launch Alliance's program manager for NASA missions, said at a recent press conference. "The reason we're able to still do it for the next few years is because since ULA was formed we've been able to integrate our launch teams, our engineering teams, our factories, everything else so we're sharing resources between the Delta 4 program and the Atlas program with Delta 2. So we're able to take advantage of that and still keep that launch service affordable." A United Launch Allianc eDelta 2 rocket launches the USAF's GPS 2R-18 satellite into orbit on Dec. 20, 2007. The Delta 2 has flown 150 times since 1989, accumulating a 98.7 percent reliability record, including 95 successes in a row over the past 14 years. Whether there will be a 51st depends if the Delta 2 can snare a firm assignment through the NLS-2 contracting system. NASA has a handful of science satellites currently being designed that fit into the rocket's weight class that will need launched into polar orbits over the next few years from the West Coast. ULA has parts to build as many as five Delta 2 rockets. "The big question right now is will there be more Delta 2s? We certainly hope from ULA's perspective that there will be. We have enough inventory left to build five more, we have all the skills that we need in-house to be able to perform those missions for the reasons I just explained — we have an integrated team now between Atlas and Delta. We are in discussions with several commercial and government customers regarding the possibility of future sales. You know that NASA is one of those organizations we're talking to," said Thorp. "We hope sometime in the near-future that results in a few more missions, and those would most likely be missions out of Vandenberg." Those five remaining "white tail" Delta 2 rockets were once envisioned to fly in the Heavy configuration with 46-inch-diameter strap-on solid motors. Since the pad at Vandenberg cannot accommodate the bigger boosters, ULA will need to purchase the regular 40-inch motors from builder Alliant Techsystems for any potential future flights. "ULA has moved into a situation where they can get the contractor — ATK — for the GEM-40's, the Delta 2 standard solids, such that it'd be roughly a 24-27 month lead time," NASA launch director Tim Dunn said in a recent interview. If a Delta 2 launch is ordered by NASA, that production time for new boosters would be feasible, Dunn said. "From the time they win a contract till the time we launch is generally 30-36 months. So they could then turn ATK on for the specific mission — a four-solid mission, a three-solid mission or a nine-solid mission."